Weight loss problem always has new solutions in the medical and nutritional space. Diets stand out in the list of weight loss methods, and paleo diet is one such among all. Once you start the paleo diet plan without giving much respect to your lovable tastes of processed foods. Mainly, baked foods. You will not be disappointed while you be on this diet because this diet has a good variety of suggested foods within its meal plan. This article has a simple description of how does this plan go through the initial 7 days, basic paleo diet food list and meal plan benefits. What to Eat.. What Not To? 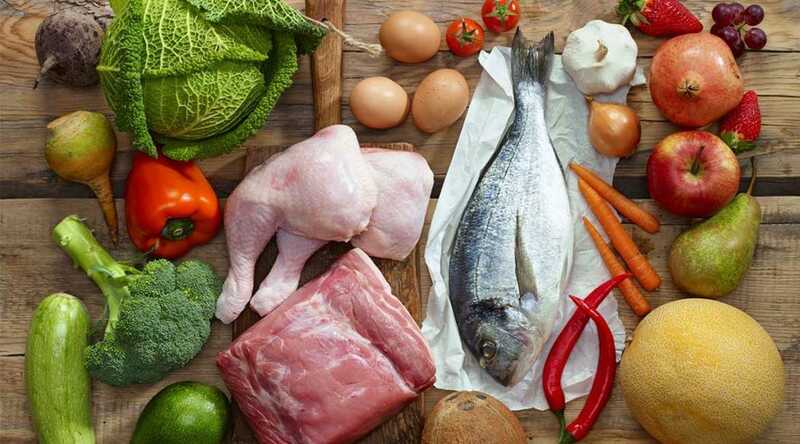 Paleo diet gives you the pleasure of having natural foods and also keeps your body so related to nature that we gradually move far from today’s common health problems, viz., blood sugar, blood pressure, obesity, overweight, gastritis, etc. We have many diet plans available through diet books in the giant library, the internet. Every diet is helpful in some or the other result like weight loss, weight gain, height increment, hydration, body pains, etc. Some may have side effects due to the person’s disability to handle the foods in the diet or problem in habitability due to strangeness. Now, here we present you a menu which has extra large effects of keeping you naturally healthy at the same time, which brings you out of the toxic food. The food today is said to be such dangerous due to its nourishment by the hazardous chemicals and also the procedure of cooking which is comprised of too much oil or baking or frying. So, simply to achieve fitness naturally without any toxins injected into your body, one is greatly recommended to look out for this rare diet routine called Paleo Diet Plan. Not to brag about the current diet, this is the best way one should eat! You can clearly observe the sophistication brought in the eating pattern by allowing a person’s ability to eat everything offered to him anytime. 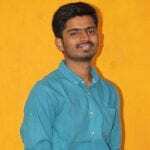 And, this is not by a forceful adoption but through a proper schematic development of one’s meal plan which is clearly explained in this article. There is nothing much to describe about the diet’s schedule and how it works; but it has a lot of technical information about this diet plan which is in below paragraphs. Go through the information provided just! It’s the way to your fruitful, healthy condition. Check this simple list of eatables and non-eatables of paleo diet plan. This is a checklist of what is paleo diet meal plan that defines the proper foods to be taken and to be avoided. More explanation is given through the cautions and benefits. Thus there’s no particular need of description for these above foods and their importance. Like any other diet plan, paleo diet plan also has a schedule of first one week, after which you may follow the same, or you might be habituated to such category of foods, you can try some other recipes. Here’s the plan suggested for three meals right from the first day.You may find a couple of recipes for a single session of this paleo diet recipes; you can opt for anyone from them. On the first day, the paleo diet recipes include vegetables, fruits, and slight amounts of non-vegetarian foods. With the sample of a single day, we can find how liberal is this diet. Two soft-boiled eggs chopped over spinach, wilted in mild olive oil and lemon, garlic mixture. Garnish it with half a cup of cherry tomatoes, avocado, green onion and drizzle this with some lemon juice. Pepper and sea salt add some taste to this recipe.A green apple or any other fruit is recommended. 150 grams of Sardines or Salmons’ salad in olive oil or a brine solution, rocket salad, 1-2 sun-dried tomatoes, sliced radishes 5-6, a medium grated carrot, pumpkin seeds 1/8th in a cup. Garnish them with 2 tablespoons of olive oil, a tablespoon of Apple Cider Vinegar. In another way of cooking, Season salmon fillets added with salt sea, and pepper is grilled in coconut oil or a couple of minutes on both the sides. Combine this with slices of orange, chives, and black olives. This whole mixture is dressed in mustard, lemon and olive oil. For dinner 200grams of grass-fed beef which is marinated in lemon juice, rosemary, garlic, sea salt, and pepper. This mixture is now grilled with coconut oil or ghee. A grilled Portobello mushroom, slaw salad of shredded cabbage, carrot, spinach, onion, parsley drizzled with lemon juice, a teaspoon of each mayonnaise, virgin olive oil. Suggested Snacks: Strawberries, Macadamia nuts, and coconut water. The leftover cooked meat is no danger in the breakfast. In fact, the actual paleo diet plan insists this habit of weekly cook-up method. So you can go for earlier cooked meat. Roasted sweet potato, Hardboiled eggs. Medium gluten-free lamb sausages added to grilled asparagus, spinach salad, red peppers, sesame seeds, dressed in lemon juice, olive oil. Mustard can be added. Turmeric chicken is strongly beneficial at night time. Kale salad after having meals. Green tea, rockmelon in 2 cups, beef jerky of 50grams. For even lunch, Leftover chicken of the second day is not a problem. A salad with it, a veggie soup, sliced pumpkin in a cup. The third day of paleo diet plan includes some workout. So, the paleo dinner recipes and their intake are a bit deferred from the previous ones. Ground beef fried, vegetables, berry fruits. Tuna or salmon fish, tomatoes sun-dried, cucumber slices, dark chocolates with 80% cacao content. Scrambled eggs with sautéed onions, tomatoes and red peppers, a salad of avocado, radish, lime juice, coriander, olive oil. Diced papaya with blueberries. Paleo lunch ideas are quite different and refreshing. It recommends nuts and fruits heavily even for lunch which looks odd at this time. But they are found to be healthy, and no ill effects are drawn from this practice. Baked salmon, parsley, lemon and garlic, green beans and broccoli steamed. Rockmelon with Prosciutto, Jamon Serrano. Leftover salmon, grilled asparagus, soft-boiled egg, drizzle with truffle oil, mixed berry fruits. Leftover enchiladas from the 4th day are okay. Chicken salad with olive oil. Nuts. As the fifth day is also a workout day, dinner diet is a bit altered. The following paleo dinner recipes are interesting to know and try. Meatballs baked spaghetti squash with sauce, green vegetables. Chicken liver 2 tablespoons, sliced carrots, and cornichons. Banana coconut pancakes, maple syrup, and blueberries. Rocket salad, cooked prawns, and smoked paprika. Sauteed kale, orange sauce, and cabbage. The last day of the paleo diet plan has some different recipes with fruits and vegetables also with some Asian touch. Grilled mushrooms, scrambled eggs, grilled tomatoes, spinach, and bacon. Lettuce leaf sandwich, meat, and vegetables. Roasted chicken with lemon, mustard, rosemary. Roasted carrot, garlic cloves, fennel, beetroot, broccoli steamed. Green peas, mint, and butter. You are not to be worried about the plan and paleo diet weight loss, as the plan itself is said as the early man’s diet. Our past humans were more used to this kind of food. Coming to the benefits point, you can find an enormous advantage to your body for being healthy all the time, maintain the nutrients level adequate, finally with no side effects and no health issues in future. You are more recommended to eat the cleanest diet of all without any chemicals, preservatives, and any other additives which take you to a detoxified state and then to a body cell We, as everybody just neglect this point of having natural, clean food, that’s what makes us sicker than any other side effect. Of course, how many diets you follow, one’s view is all concentrated towards the weight control. Paleo diet weight loss is the foremost thing to be mentioned without any ambiguity. Technically speaking, weight is lost mainly due to reduced carbohydrate intake. This is possible by avoiding processed foods, and if you just follow the diet mentioned in the weekly plan, that is enough. Once you stick to paleo diet basics, you need not worry about the health problems you are facing. More than anything, you need not count the calorie amount with which you are taking the meals. The diet also involves some workout days, so, better avoid the fat gaining foods and carbohydrates to eliminate the carb increment, thus, reducing the counter-pressure of weight loss during the workout. The gradual effect of fat intake or the mentioned preserved meat intake, you will be able to increase the content that provokes the cells to be fed full-fledged. This at one stage, leads you to a position of being plenty rich of insulin. It is an obvious fact that insulin controls diabetes very much. The food prescribed in the paleo diet meal plan is so much anti-inflammatory by its nature. There’s a narrow risk, almost zero-risk of getting affected by the inflammation unless you ignore the meal plan while being on the diet. Inflammation also causes cardiovascular problems, also which is minimized consequently. The food suggested is the way too digestive, you have no issues with this particular thing, digestion. 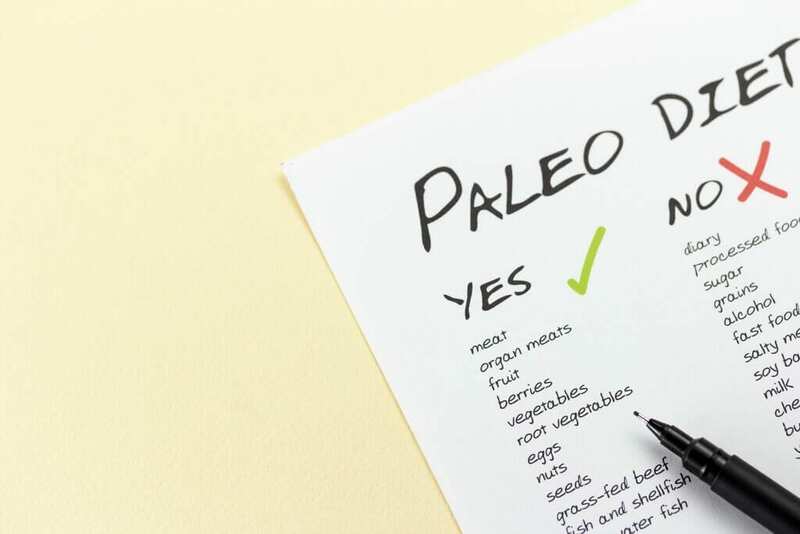 As this meal plan is said to be genetically designed, that our ancestors and past humans also survived through this food, there’s no special question of digestive problems in the paleo diet plan. You need not ask about this point in special, a healthy diet, which is a fulltime one with above many restrictions, will, however, provide such nutrient ingredients like vitamins and minerals o a vast kind. This should be a renowned benefit of any other diet. A special suggestion is to increase your vegetable content and also a variety of vegetables in the diet. The more colored vegetables you take in, the more are the nutrients you gain. Have a rainbow of vegetables for all the time in your fridge. Most Important One, Don’t Miss This! The diet involves more pasture-raised eggs and meat. This means you are suggested to take the foods out of the naturally grew animals and hens. The animals live by eating natural grass and hens too, which follow the cows over the grass and have the cow pie. Again the cow pie fertilizes the grass naturally, which eventually makes this life circle a completely organic and natural one. Thus, by having the pasture-raised meat and eggs, you not only get great nutrients but also serve the life cycle in this particular context. The fats and processed foods make the intestinal function to retard. Mainly sugar does this. The junk in the processed foods also causes inflammation. If you are equally stressed along with this ill-food-habits, you may be prone to the leaky gut syndrome, which causes the cells to be at the unreachable stage of food transportation. You are lucky that you are on the diet which completely avoids the fat intakes and encourages raw foods. The cells are to be maintained a perfect balance between saturated and unsaturated fats, which is the most important factor regarding the cells functioning and their health. This is quite well managed through the paleo diet plan. The salmon fish and cold water fishes contain abundant amounts of protein and fat. Salmon is full of omega 3 fatty acids which are very healthy for eyes with Vitamin A and heart, brain functioning is improved drastically. Pasture-raised eggs and meats also give omega 3 fatty acids. Muscular mass is mainly a dependent factor of protein which provided through the animal flesh of paleo diet recipes. It also builds new cells and also improves metabolism of the body cells. This, in turn, shrinks the fat cells by sending the extra stored triglycerides, sugars, and energy to glycogen in muscles. The paleo diet plan also has plenty advantages which are going to be discussed in following paragraphs. But here, there are a few things to be kept in mind before starting the diet and while being on the diet. It is a must that one needs to do enough workout to make the diet successful. But it is not recommended to go on the daily exercise. Exercise is necessary on the alternate days. However, without proper exercising, diet is said to be incomplete. Health benefits are mostly dependent on fat control, if any excess contents of fat that are given through the diet, they are vanished by proper workouts. As we always insist you before taking up any diet plan, you must consult a dietitian for advice whether you can try for such particular diet or not. You should check it once or twice that if you could adopt such meal plans as a regular food or not. This is not a big issue to deal with. But however, one cannot simply go on the paleo diet meal plan because of the variety of food groups, which is hard to sustain for a long time. One more point to mention, our meal plan is given with a lot of various paleo lunch recipes, paleo dinner recipes in different diet patterns. So, one could not easily adapt to particular conditions in a diet after the beginning. You need to stick to one basic flow chart, which enables the positivity and thus, you may avoid the food of such diet. When you go on increasing the fat contents like bacon, coconut oil, T-bone steak, etc. you will be no more in the safe zone of the healthy fat condition. These fatty meals should also be limited when the health is concerned regarding the saturated fat content though fat is one of the major paleo diet plan benefits. At this last part of the article, you can find the recipes recommended for the perfect diet to go on. 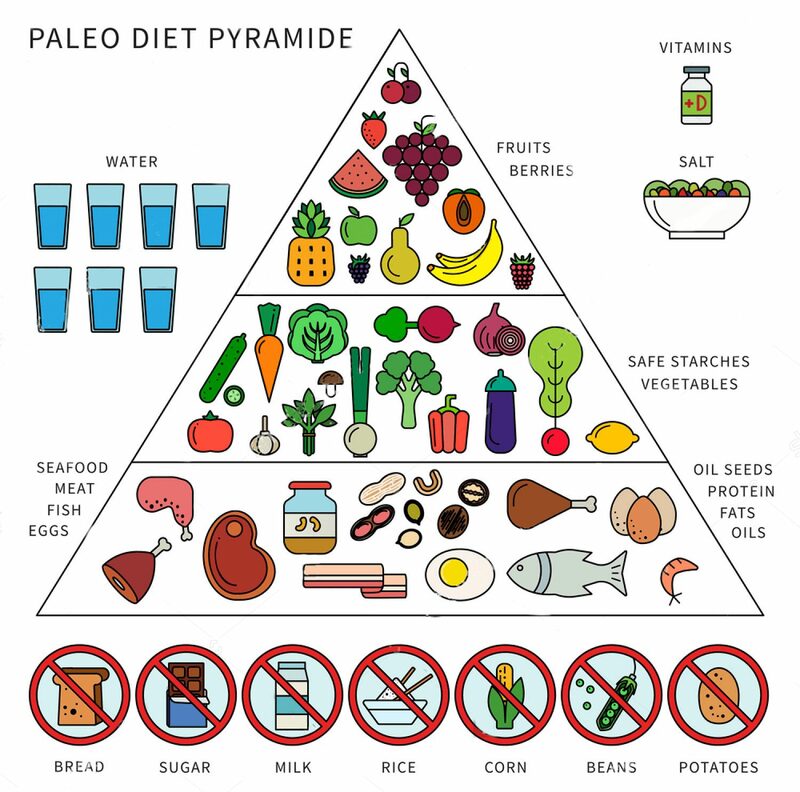 In paleo diet plan, you must seek the food which is only prescribed through the plan, but do not work on your own plan. It is a very important aspect regarding the health control. The Paleo diet benefits are enormous with the help of these recipes directly. You need not go for any special exercise. Firstly the paleo breakfast has a couple of suggestions for recipes, take a look. Ingredients: 1 Acorn squash, 2 eggs, a tablespoon of fresh chives, salt, and black pepper. On a baking sheet, place that half piece of acorn squash facing down. After 30 minutes of baking, squash becomes tender, take it out and keep it for cooling for 5 minutes. Now into the holes of squash, pour the cracked raw eggs in each half of the squash. For the egg to be baked, put it in the oven again or 15 minutes with salt and pepper included. After which, chives are used for garnishing, then to serve. Ingredients: 1 egg, ½ avocado, 2 sliced bacon, lemon juice 3-4 spoons, sea salt, black pepper. Add salt and pepper, after which it should be served immediately because it loses its taste and becomes vague after a prolonged time gap. Ingredients: 1 kg of sweet potatoes, 2 cups of chicken stock, 1 tablespoon of each ground cinnamon and ground nutmeg, ½ cup of coconut milk, 1 teaspoon of ginger, 4 slices of bacon. Add the chicken stock, cinnamon, nutmeg, ginger to the sweet potatoes in a cooker with simmer flame. Cook on simmer for 6 long hours. Add coconut milk and blend the mixture until this mixture becomes creamy. Bacon put on the top of it, serve the meal. These are the refreshing and simple recipes for paleo diet breakfast. You can repeat this for every three days. Let us go for the paleo lunch ideas which better your way of healthy eating. Ingredients: 2 Zucchini, 1tsp(tablespoon) sea salt, 2 tbsp(tablespoon) coconut flour, 1 egg, 4 scallions, 1tsp cayenne powder, 1tsp black pepper, 2tbsp coconut oil. Mix the zucchini with sea salt by stirring. Put it aside for 10 minutes. Squeeze the water out of zucchini after 10 minutes. Take a new bowl, stir the coconut flour, eggs, scallions, cayenne and pepper in it. Add coconut oil to a skillet at the medium heated situation. Once the oil is melted, place the fritters made into pieces, make them brown by heated on both the sides. Garnish it with scallions and serve. Ingredients: 4 Turkey cutlets, 6-7 tomatoes sun-dried 3 tbsp fresh basil leaves, 2tbsp pine nuts,1/2 tsp sea salt, 3-4 tbsp olive oil, coconut oil and black pepper. At medium to high heat, toast pine nuts and don’t let them become too brown. Blend the sun-dried tomatoes, basil, toasted pine nuts, and salt mixture. Keep the cutlets on the plate, add salt and spread the sun-dried tomatoes over each of the cutlets. Starting at one end, tightly roll up the cutlets and pin the roll with a toothpick. To heat the rolls, preheat the oven containing a medium skillet with coconut oil spread over it. The roulades are heated till brown, for around 10 minutes. Cut the roulades and serve. Ingredients: 1 pound of turkey meat, 1 bell pepper, 1 onion, 3 celery stalks, 1 garlic clove, 1 tsp of each cumin and chili powder, 2 cups of tomato sauce, ¼ tsp of each cayenne pepper, red pepper flake, sea salt, coconut oil, and black pepper. Heat the coconut oil in a bigger skillet, add onion, pepper, celery and sauté for 5 minutes until it becomes soft. Add the garlic and again sauté for 2-3 minutes. Add the ground meat and cook until it turns brown. Add tomato sauces and spices, stir the mixture thoroughly and scrape the bottom, if any bits stick to the skillet. Now cook again on the medium heat until sauce gets thickened. Serve the meal when it is hot with steamed vegetables. These are the paleo lunch recipes, which are only suggested for meal time but not for breakfast or any other timing, it’s okay if you take these recipes for night time as a leftover meal. Better follow the instructions mentioned throughout the article for a healthy practice. Look down for the paleo dinner recipes now. Firstly, combine the meat and chorizo with hands so well and divide this into 6 equal patties. Place the patties in the oven preheated at 400 degrees Fahrenheit on a baking sheet for around 20 minutes until temperature reaches 170 degrees. Add the mentioned ingredients after you take out the burger and add sea salt and pepper. Serve after drizzling the lime juice onto the mixture. Ingredients: White Chicken, Tomato sauce, tomato paste, onion, paleo butter, garlic, ginger, garam masala, bacon, sea salt, and cracked pepper. Melt the cooking fat on high in a Dutch oven and sear the chicken pieces on each side for 3 minutes. Stir in garam masala and grated ginger. Reduce the flame to low, add tomato sauce and tomato paste. Wait for 5 minutes while everything gets combined to become a good mixture. After that, cook the chicken with the mixture and sauce covered, for about 20 minutes, until chicken turns red. Chop cabbage, cucumber, onions, mushrooms along with spinach. Take a large salad bowl and put the mixture down into the bowl. Sprinkle the onion powder, garlic powder, salt pepper, vinegar, and oil. Mix the mixture gently and serve. This is all with the detailed description of paleo diet plan and its menu for one week. Healthy eating always encourages you to be healthy and maintain the body with least ill effects. With all good wishes, we welcome you to be part of this diet, thus, get into a complete organic life!